New Jersey Gov. Phil Murphy (D) and Delaware Gov. John Carney (D) jointly agreed on Feb. 13 to a toll rate increase for the Delaware Memorial Bridge in order to fund “necessary safety and infrastructure projects,” which the Delaware River and Bay Authority officially adopted on Feb. 20. The new toll rate for passenger cars and small trucks will increase by 20 percent to $5 on May 1, the DRBA said, while commercial vehicles will pay $2 more per axle. The toll hike is expected to generate an extra $32 million in annual toll revenue, as roughly 36 million vehicles cross the twin spans of the bridge every year, noted Gov. Murphy in a statement. “This proposal allows us to invest in the Delaware Memorial Bridge to keep it in good-repair [and] ensure the safe passage of travelers from New Jersey and Delaware, while addressing the commuting costs of our residents, critical goals shared by both states,” he said. Gov. Carney noted that the additional toll revenue is now available to match a $22.3 million Better Utilizing Investments to Leverage Development or BUILD federal grant, as well as a $6 million Federal Transit Administration grant to repower and retrofit two ferry vessels. 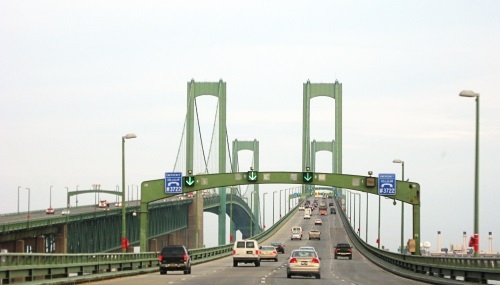 With the additional revenue, the DRBA said it now has the resources to fund several “significant” major capital projects planned for the Delaware Memorial Bridge and Cape May-Lewes Ferry: $48.2 million for bridge paint removal and recoating; $24.5 million to replace suspension cables; $40.5 million for bridge steelwork repairs; $19.7 million pin and link rehabilitation on both bridge spans; $45.2 million for a ship collision protection system; $21.5 million for bridge deck repairs; $4.3 million for transfer bridge repairs at the Cape May–Lewes Ferry; and $9.5 million for a ferry repowering program.